Studio Ghibli has unveiled a minute-long teaser for Isao Takahata’s upcoming animated feature The Tale of Princess Kaguya, reports /Film. 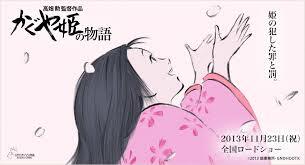 Based on the ancient Japanese folklore “The Tale of the Bamboo Cutter” The Tale of Princess Kaguya was originally slated to open alongside Hayao Miyazaki’s The Wind Rises earlier this year, but was delayed and will now open in Japanese theaters on November 23, 2013. No US release date has been set.